Taglines: The extraordinary true story of the woman who crossed the desert and changed the world. Anachronisms: Lucinda (from the modeling agency) says to Waris she would be without broadband in Africa. Broadband didn't exist in the early to mid 80s when this story took place. Desert Flower is a weird movie. 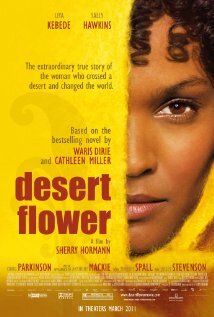 It is based on the life story of Waris Dirie, a super-model up there with Naomi Campel and Cate Moss. The movie focuses on the time from just before her discovery until her big success, with constant flashbacks of her childhood in Somalia and her way to London. Liya Kebede plays a wonderful Waris Dirie, very lovely and full of surprise and fear of the daily life we all take for granted, while at the same time showing great bravery and a strong will to fight for a better life. The rest of the cast is medium at best, a positive exception only the character of Terence Donovan, the photographer. The director did not resist the temptation to give Waris a sort of "funny sidekick-friend" as well as the stereotypical I-Jumped-Out-Of-"The Devil Wears Prada"-Movie - manager, to add some slapstick-touch, which was totally unnecessary.The movie does not leave anyone untouched though, it has some heartwarming and touching as well as some very cruel and disturbing passages. It is funny and sweet when Waris is struggling with the British everyday life, making friends, and so on. It is hard to bear when you are faced with drastic pictures of a 3 year old girl being circumcised, with a 19-year old woman suffering still from this cruel and brutal violation, and with the fact that a whole tradition tries to justify this. And that is the main weak point of the movie. The changes from the funny, light and sweet scenes to the brutal and cruel ones come without warning. The editor or director does not give you the time to set your mind to that kind of situation, and after a hefty scene they just switch back to the light comedy-part as if nothing happens. While I understand the intention, for me as a viewer I could not enjoy the funny parts - which were never the less intended to entertain the audience. I recommend this movie if you can handle the topic, but do not look for a entertaining biopic with some depth. It has entertainment, it has depth, but it tries to deliver both but never brings it home all the way in the one or the other topic.